By now all four instruments are complete – all bodies are closed, all scrolls have been carved and inserted, and Yonatan went through all of them once more, applying final touches with his most precise instruments where needed. Now comes another important and magical stage – varnishing! 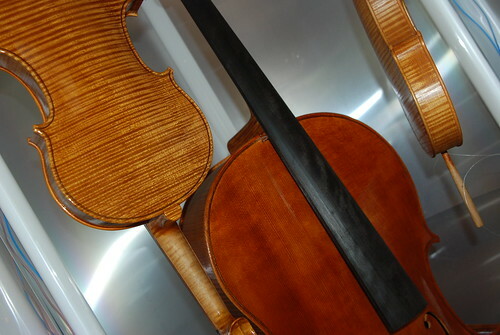 The varnish plays an extremely important role in the final outcome of the stringed instrument, as it provides necessary protection for the wood over the many years the instrument will be playing. 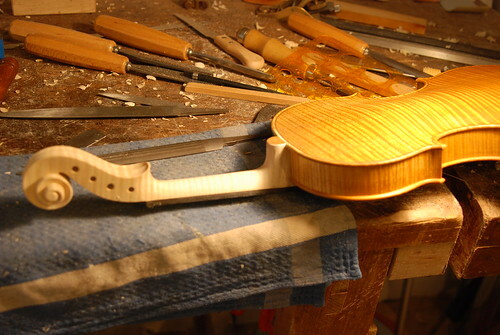 Of course the varnish also gives the violin special colors and adds that beautiful, shiny glow. 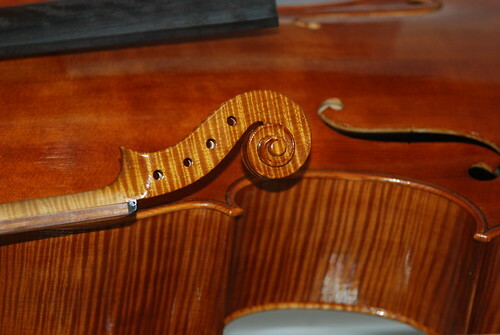 As was the case with other crucial steps, varnishing is where the violin maker's artisanship – knowledge, sure hand, sensitive eye, and patience … that illusive quality once again - really shine. Well, literally SHINE. As you can see from the pictures, Yonatan is now working on all four instruments simultaneously, varnishing one, and while the varnish is drying, varnishing the others. Making the varnish from scratch on his own and working with natural substances only, Yonatan can only control the final shade of the varnish to a certain extent. 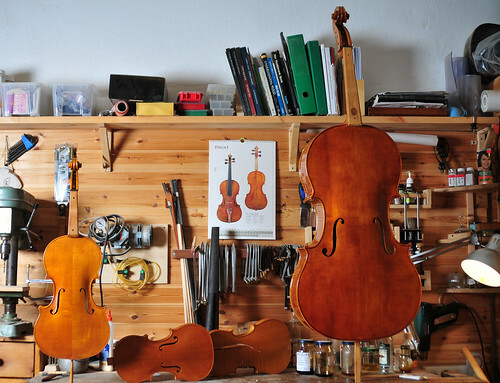 As with Nature more generally – much is out of his hands as the varnish takes a life of its own (especially since, if you Constant Reader remember, the sound boards of the four instruments are made from different pieces of spruce tree, although the rest of them is from that famous single maple trunk). 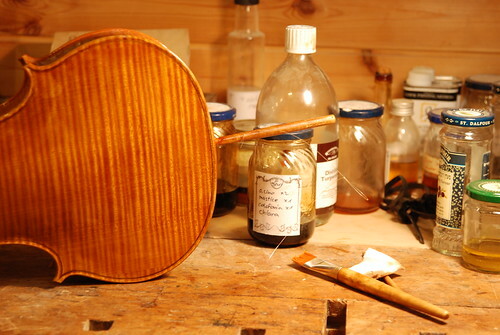 Is it a wonder that so many myths exist around varnishes in general and those of Stradivari more specifically? There are just so many variables here – the rosins, the temperature, the dyes, the quantities, the boiling time, the number of varnish coats ("mani", meaning "hands" in Italian) used, etc. etc. etc., that it almost begs a myth of the perfect, secret, untold receipt that would make the perfect violin. Unfortunately, we don’t believe in myths. Really beautiful. I hope you are both proud of your beautiful "kids"! It's absolutely gorgeous, I LOVE one-piece back. Wonder what those beautiful instruments will sound like when it's complete.